Guest post from our friend, Danette May, America's leading healthy lifestyle expert. To know papaya is to love it! Papaya is a fruit that many people never taste until they go on a tropical vacation. Once they do, they find it at home and add it to salads and their breakfast menu. “Ah! It tastes like vacation!” and your body loves it just as much as your taste buds do! Papaya's unique taste comes from an enzyme that is also extremely good for you. The enzyme in papaya is called “papain.” It's a digestive aid that is so effective at breaking down proteins that many people drink a glass of papaya juice every day to combat constipation and other stomach troubles. Papain isn't the only thing that is good about papaya. The beautiful orange flesh of the papaya contains other enzymes that do the body a world of good. Let’s look at papaya’s benefits and why you should add it to your healthy diet. Papaya contains a ton of great enzymes. Some of them fight inflammation when taken internally. Others are good at helping to heal skin burns when applied topically. Antioxidants: What Are They and Why Do We Need Them? Papaya is rich in phytonutrients and antioxidants. When eaten, both fight free radicals and protect your body against cancer and heart disease. Consuming raw papaya is an excellent tool in the battle against diabetes. Its high fiber content helps maintain blood sugar levels. In some parts of the world, papaya flowers are sautéed in oil and eaten to prevent diabetes. Papaya’s high fiber content helps to fight high cholesterol. Papaya offers high levels of important vitamins, including vitamin A, B, C, and K. These vitamins help to boost the immune system. Nutrient dense! Eating a single papaya gives you more than two times your recommended daily dose of many vitamins. It doubles as a beauty product. Have you ever put papaya on your skin? It is a natural cleanser that lifts away impurities. Papaya is rich in minerals that help with the symptoms of arthritis. These include calcium, potassium, magnesium and copper. Eating papaya can also help to prevent osteoporosis. Boosts weight loss. Papaya is a great addition to your diet if you are trying to lose weight. A single serving has very little fat or cholesterol. It contains 2.5 grams of dietary fiber and 15.7 grams of carbohydrates. When you shop for a papaya, you don’t need to buy one that is ripe. 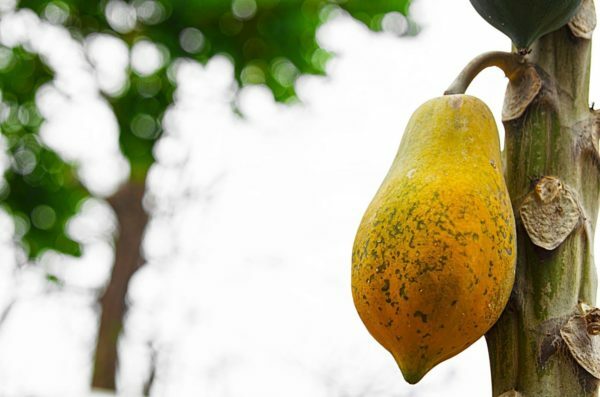 Papaya will ripen in your home like a banana. Look for one that is a little green or yellow, then keep it on the counter for a couple of days. When it is ripe it will be bright yellow and soft to the touch. Then you can keep it in the refrigerator for about a week in a plastic bag. TIP: You can speed the ripening process by putting papaya in a brown paper bag. Many people simply peel and slice papayas and eat them raw in salads, but they are also delicious when they are cooked. One of my favorite ways to make sure we are getting a papaya a day is to have it for breakfast, and this papaya boat recipe is a deliciously easy way to do it. Slice a papaya in half and scoop out the seeds. (Save the other half for tomorrow’s breakfast or for a lunch salad or dessert). Put chia pudding in the center and sprinkle with the other ingredients. Mix it up and enjoy! If you like this recipe, you'll LOVE Danette's recipe book with over 150 easy to make, super yummy and oh-so-healthy recipes! Click here to order –> Bikini Body Recipes.